As part of our getting into golf series written by Kim Dowsing, partner of regular Golfshake contributor Derek Clements, Kim and Derek visit Hellidon Lakes in Northamptonshire. 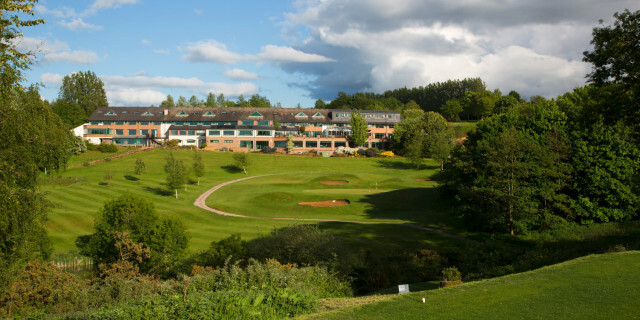 Hellidon Lakes is set among the rolling hills of Northamptonshire and, at the risk of sounding like a cliche, it is one of golf's hidden gems, home to three superb nine-hole golf courses and the sort of luxurious accommodation you would expect of any QHotels destination. The first thing to say is that, from the outside, the hotel is not a thing of beauty. It is the sort of building that Prince Charles may well describe as an architectural carbuncle but you should never judge a book by its cover, and it is what lies inside that really matters. From the second we walked through the main entrance we were made to feel welcome by a friendly receptionist for whom nothing was too much trouble, and our room was a delightful surprise, comprising a hallway, lounge with sofa, chairs, table and TV, a bedroom with another TV, luxurious en-suite facilities and a bed that was both massive and incredibly comfortable. We were also struck by the fact that everywhere and everything was spotlessly clean. After settling in we headed down to the Terrace Bar, which features stunning views across the golf course. Sit with a drink and a sandwich and watch as golfer after golfer comes to the final tee on the Lakes Course, a simple enough looking par three that measures 152 yards - the problem is that after tackling 17 holes, you climb on to the tee and face a shot over a lake to a raised green surrounded by bunkers. 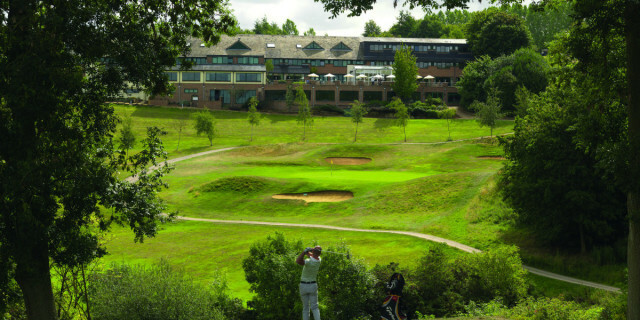 There are several bars and eateries in the hotel but the jewel in the crown is the Lakes Restaurant, which also features those amazing views of the 18th hole and beyond. It goes without saying that if you stay at a four-star resort you expect the food to be of the best quality, and we were not disappointed. Himself started with ham hock, followed by blade of roast beef with roast potatoes and carrots and chocolate tort for desert. I had feta cheese and olive salad, tandoori coli fillet with vegetables and chocolate brownie for dessert. It was all beautifully presented, it tasted fantastic and was washed down with a bottle of competitively-priced Merlot. The restaurant staff were friendly and attentive, ensuring that we were served promptly and that we were happy with both the food and service we received. We then headed to the lounge bar for a drink. Although it was busy, the atmosphere was relaxed, and the bar staff were extremely friendly. If you would rather opt for room service, put your feet up and choose from the outstanding range of sandwiches, light bites, home-made pies, stone-baked pizzas, grills, mains, sides and mouthwatering desserts, all served in your room with a smile. Breakfast is a buffet. This can often be a huge letdown, with overcooked, cold food. But not at Hellidon Lakes. The quality of the sausages, bacon, mushrooms, scrambled egg and tomatoes was top drawer, and fried and poached eggs are made to order. There is also a wide range of breakfast cereals, bread, rolls, croissants and fruit juices. You can also go back for seconds (or thirds! 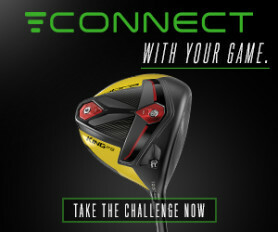 ), setting you up for the golfing challenge that lies ahead. The complex features eight lakes, a four-lane 10-pin bowling alley, health club, spa and swimming pool, meeting rooms, 106 bedrooms and, of course, free wi-fi. It is located in Northamptonshire, with part of the complex in Warwickshire and views across Buckinghamshire and Oxfordshire. On a clear day, the views across the surrounding countryside is to die for. A nice touch was that within 24 hours of returning home, we received an online survey asking us how we had enjoyed our stay. The survey questioned us on every aspect of our experience and is clearly done with the intention of ensuring that Hellidon Lakes has done everything it can to give you a great experience. Too often, you come away from a golf resort with the impression that the only thing they are really interested in is taking your money, so it is refreshing to come across a company that actually cares about its customers. There are three loops of nine holes, all of which are parkland layouts featuring hundreds of trees, bunkers, well-placed water hazards and hills - when you finish 18 holes here, you know that you have had a workout. It may only measure 2,791 yards, but the key to playing The Valley well is to hit the centre of the fairways. There are some wonderful par threes, starting with the opening hole, which may only measure 136 yards but requires pinpoint accuracy. The tee is raised and you play to a sunken green surrounded by bunkers - go too far and you face a very challenging recovery shot. The second is another par three, this time measuring 174 yards. Once again, the tee is raised, with a shot played to a green protected on one side by a lake and on the other by a huge tree - there is no margin for error. The fifth is a classic par four of 348 yards featuring four water hazards. Ensure that you don't hit your drive too far or else you will end up wet. There is also a well-placed tree to be avoided before an approach to a small green. The seventh is a dogleg measuring 458 yards. It is uphill, features a tight fairway with water on the right and it plays every single one of its 458 yards. The ninth is a par four measuring 307 yards, all steeply uphill and playing closer to 400 yards. You drive over a marker in the middle of the fairway and then hit your approach to a raised green. The first hole on the Hellidon is 292 yards long and is played into and across a sloping valley, with trees and a lake to be avoided. The second is a great par four, a dogleg measuring 404 yards that runs from right to left. You have the option of taking your drive across the trees on the left, but get it wrong and you will be putting another ball down - and that is without taking into consideration the trees on the right and the approach to a small green protected by a couple of bunkers. The sixth is a tough hole, another dogleg that measures 468 yards. Once again, the key is to find the middle of the fairway from the tee. Your approach will require at least one more club than you think to clear the two bunkers short of the putting surface. The eighth is arguably the best hole on the course, measuring 474 yards, all played uphill. There is out of bounds on the right, and a huge stone hazard 180 yards from a small green surrounded by trees. The hole numbering on the Lakes runs from 10 through to 18. The 11th hole is a 479-yard par five. The fairway is protected by trees on both sides and is a gentle dogleg from left to right. Find the short stuff but stop and think twice before going for the green - there is out of bounds all the way down the left, as well as a deep bunker and lake to the left of the putting surface - go right and you will be playing a recovery from the trees. The 12th, at 464 yards, is called Shepherd's Rise and is the signature hole. The view from the tee is spectacular, but it is also intimidating, with a small lake to the right and a large water hazard to the left. The fairway is narrow and to add to the difficulty, the ideal tee shot should be played as close to water hazard on the left as possible. There are more trees left and right before an approach to another small green protected by a tricky bunker to the left. Get out of here with a par and give yourself a pat on the back. The 14th is another breathtaking par four, measuring 387 yards. There are trees to the right, and three water hazards and a ditch to the left before an approach to another small, well-protected green. And then there is that wonderful 18th, a par three measuring just 152 yards. It is played over a lake upon which geese happily swim. Just beyond the water is a huge patch of rough, rushes and wasteland. The green is surrounded by bunkers. To add to the intimidation factor, when you stand on that final tee you know that your every moved is being watched from the Terrace Bar. A great finishing hole. Hellidon Lakes is highly rated and well worth visiting. For more information click here.